I am about to reveal ALL OF THE THINGS that happen in this comic! If you haven’t read it, turn away! Okay, carrying on. We’ve got a couple of new developments in this issue. The first ten pages are devoted to Diana and Hessia living it up at a dance club and Diana then chasing that new dude who’s trying to kill her through London. Nothing actually happens; the dude tries to kill her, misses, and ultimately gets away. He rides a pegasus, which is pretty rad, I suppose. SIDENOTE: Pegasus is the classic winged horse, but I don’t know if this is THE Pegasus or another winged horse, or if we call all winged horses pegasuses or just Pegasus. I’m going to go with calling it a pegasus for now, and you can correct me in the comments if I’m wrong. Anyway, not a lot goes on in the first half of the issue, but then we get a flashback and learn that the mysterious would-be assassin is Aegeus, a descendant of Thesus and thus Poseidon, and he’s trying to claim what he thinks is his rightful place as a god. We still don’t know who he’s working with, but there are hints that it might be Strife. Speaking of Strife, she shows up a little later to free Donna Troy after Wonder Woman has a long and boring conversation with her imprisoned sister about forgiving herself. Strife convinces Donna to go see the Fates. And that’s about all that happens. 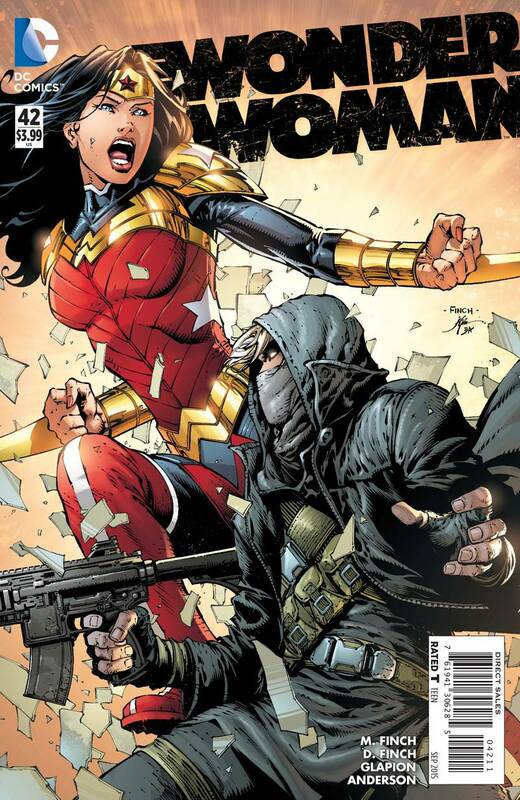 In terms of changes from where we were at the end of last month’s issue, Wonder Woman knows Aegeus is after her, we know Aegeus’ backstory, and Donna Troy is free. Rather than dig into various aspects of a story I don’t particularly care about, I’m going to focus on one scene to try to articulate why I find this comic so bland. It’s the opening scene, with Diana and Hessia at a dance club. When I posted the preview for this issue on Monday, I talked a bit about the cliché of the woman who’s harassed by a guy and then decks her harasser. It’s been done a bunch of times, with diminishing returns, and this is one of the most clichéd versions I’ve seen. The actual scene in the book is longer than the preview, with the dude hitting on Diana for a page beforehand and Diana clearly stating she’s not interested. The guy is a walking caricature, Diana’s reaction is exactly what you’d expect, and her speech afterwards aims for empowered anger but just reads as tacky. I understand what Meredith Finch was going for here, but it all just comes off as stale. Apart from the harassment bit, the writing in the scene feels incredibly flat on several levels. There are more clichés with Diana spouting the usual “This was just what I needed”, dancing her troubles away line that you can see in pretty much any scene sat at a dance club in any form of media. Moreover, the club is in London, and you can’t tell at all. Nothing captures the locale in the slightest. I’m not saying that there should be Union Jacks everywhere and that Diana’s fellow dancers should be talking about tea and crumpets and the queen, but there should be some sense of setting and instead there’s none. It’s all just generic. In Azzarello and Chiang’s run, when Diana needed to blow off steam she went to a punk club. It had atmosphere and a sense of place and said something about the character. Meanwhile, this scene is just completely nondescript. It is all so very bland and nonspecific. Finch is not good at investing clothing and settings with any kind of mood or characterization. Because of this, he fails to set a scene properly, and also fails to communicate anything about the character and who she is through his art. This scene is like the clip art version of a dance club, everything boiled down to a simple, dull, non-detailed version of things. I suppose we should be thankful that Finch didn’t try to come up with more creative outfits for Diana and Hessia, because he does so for Hera later in the issue and the result is a belly top and a loin cloth. It’s not great. His Zola is much improved, though! I’ll give him credit for that. He’s got her back in plaid and looking a bit more like herself. Ultimately, this hopelessly bland and generic club scene is indicative of the Finches’ run as a whole. They’re not investing the characters with unique attributes that make them more than cardboard cutouts, and they’re not putting them in situations that speak to who they are in some way. Plus, they’re spending four pages on a clichéd dance club scene that really adds nothing to the book when they’ve got a dang pegasus in the mix. Pegasuses are SO COOL. How do you not have four pages of rad pegasus fun instead? I feel like everyone in this book needs to push a little more. Dig into each scene, figure out why it’s in the book, what it’s saying about the characters, how you can bring out a bit more of everyone, add some excitement to the book, or do something unexpected. It all just feels boringly surface level and shallow, without much thought put into it. A pointless club scene, unfruitful chase, hints of backstory, and a moderately shocking ending is a really dull formula, doubly so when poorly executed. It’s hard to get invested in a book when there’s so little to get invested in. This entry was posted on July 22, 2015 at 2:49 pm and is filed under WW Comics. You can follow any responses to this entry through the RSS 2.0 feed. You can leave a response, or trackback from your own site. This whole run is generic, tacky, ill-conceived and an embarrassment for a company like DC. If this is how they treat their clientele, they don’t deserve it. They only get away with it because our loyalty is unshakable. Generic, tacky, and ill-conceived are words that definitely capture this run. There are way better books out there, though. Generally speaking, this is a fantastic time for comics, with so many publishers putting out loads of great titles. Wonder Woman’s just not part of that currently. Indeed. Mystery solved! David Finch must be a bit behind. I’m surprised, and a little bit impressed, that we haven’t had a fill-in artist yet. Finch usually doesn’t do this many issues in a row. We know it’s in London because the homeless guy talked like he was out of Dickens. He said “poor bugger” and “Milady.” Now that’s some local color! Oh, true, I’d forgotten about the homeless guy! He was definitely quite Dickensian. The dance scene before that, though, was just hopelessly generic. I kinda like seeing Nikos Aegeus again (although I guess he’s just going by Aegeus now). He’s been altered a bit from the Pre-Crisis version, but that’s fine, since he was a relatively minor villain anyway. The important part is that he’s a mortal dude who uses weapons of myth to fight Wonder Woman. I think he has a lot of potential as a villain, and could be a lot of fun. Unfortunately, that’s the only thing I liked. And really, I only like the idea of it. The execution was terrible. Meredith Finch is just not a good writer, at all. She relies so heavily on cliches, her dialogue is lazy, she doesn’t know how to reveal information organically–it’s all just dumped out awkwardly–and I feel like she keeps repeating the same scenes and plot points. Just like last issue, we get a scene of Diana visiting Olympus to lecture Donna, and she says virtually the same things to her! We also get a second confrontation between Diana and Aegeus, which yields no advancements in the plot. And as with the previous arc, we have a new villain being guided and empowered by another mysterious villain operating behind the scenes. Hopefully this will be their last arc on the title. I think with all of Wonder Woman’s history at your disposable, Aegeus feels like a weird, deep cut to bring back. On the other hand, at least they’re not ruining someone really cool. At this point, I’d be surprised to see the Finches back for another arc because this book is just screaming for a revamp, especially with Batman v Superman on the way. But DC is weird. It’s hard to predict what they’ll do.